9/6 Cup of Coffee: Venezuelan pitching prospect Anderson Espinoza took the next step in his rise through the Red Sox minor league system last night, making his much-anticipated Low A debut after being promoted from the Gulf Coast League earlier in the week. Battling for a wild card spot, the Drive split its doubleheader against playoff-bound Savannah. PawSox starter Zeke Spruill (pictured) turned in his best outing of the season, helping his team to a 6-2 victory by throwing seven scoreless innings. Portland failed to keep up with New Britain's offensive onslaught, while Lowell opened its final series of 2015 in disappointing fashion. The PawSox put together a strong night at the dish to kick off their final series of the season, with the lineup combining to reach base 17 times (11 hits, six walks) in 33 plate appearances. Right fielder Aneury Tavarez turned in one of Pawtucket's four multi-hit games, finishing 2 for 3 with a two-run home run and two runs scored. Shortstop Marco Hernandez reached base four times, going 2 for 3 with two walks and two runs scored. Third baseman Carlos Rivero chipped in two RBI, finishing 1 for 4 with a double and a walk. Starter Zeke Spruill improved to 5-10 thanks to one of his best performances of the year, tossing seven scoreless innings and allowing three hits and two walks against five punchouts. Spruill faced only 25 batters in his outing, which featured three three-up-three-down frames. Right-hander Pat Light was roughed up in 2/3 of an inning of relief, allowing two runs on four hits before making way for right-hander Dayan Diaz. The 26-year-old Colombian drew his fourth save of the season after allowing two hits, no runs and a walk against one strikeout in 1 1/3 frames. The Sea Dogs failed to keep up with New Britain's relentless offensive output, which saw the Rock Cats score a run in six out of nine innings – including a four-run top of the eighth that put the game out of reach. Portland was decent with runners in scoring position (5 for 17) but had its share of wasted opportunities, leaving a whopping 14 men on base. Center fielder and leadoff man Manuel Margot was the team's offensive engine, going 3 for 5 with a two-run home run, three RBI, two runs scored and a walk. First baseman Sam Travis (1 for 2, RBI double, three walks) was also an on-base machine, reaching four times. Left fielder Keury De La Cruz finished 1 for 5 with two RBI and a run, while third baseman Dustin Lawley went 2 for 4 with an RBI double and a run scored. Right-hander Luis Diaz struggled through 4 2/3 innings of work, allowing five runs (four earned) on eight hits and two walks against two strikeouts. Right-hander Heri Quevedo gave up three more runs across 2 1/3 relief innings before making way for right-hander Kyle Martin in the top of the eighth. Martin blew his save opportunity and dropped to 2-1 after tossing one frame, giving up three more New Britain runs on three hits and two walks against three punchouts. Right-hander John Cornely rounded things out by throwing a scoreless ninth inning. Salem starter Ty Buttrey fell to 8-10 on the year after allowing five Potomac runs on seven hits and two walks in five innings of work. 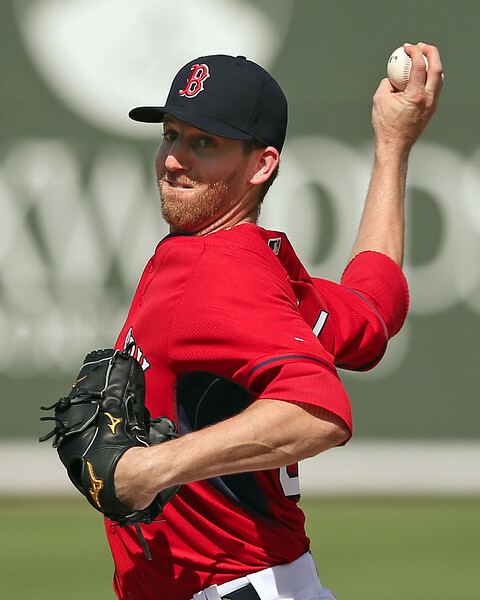 SoxProspects.com Executive Editor Chris Hatfield was in attendance, and shared a few observations on Buttrey's outing. The 22-year-old right-hander was replaced by left-hander Mike Adams in the bottom of the sixth, who rounded things out on the bump. Adams allowed the Nationals' sixth and final run on four hits and a walk against two strikeouts in three innings of work. The Red Sox were somewhat toothless at the plate, mustering only one extra base hit and finishing the game with nearly as many strikeouts (seven) as hits (eight). Designated hitter Kevin Heller posted the lineup's lone multi-hit game, going 2 for 4. The extra base hit came off the bat of catcher Jordan Procyshen, who went 1 for 3 with a double and a walk. Second baseman Wendell Rijo reached base twice, finishing 1 for 3 with a walk and a run scored. Venezuelan phenom Anderson Espinoza's Greenville debut highlighted game one of the doubleheader, with the precocious right-hander turning in a 3 1/3 inning start. The 17-year-old – who was promoted from the league-champion GCL Red Sox on Thursday and is playing at his third level of the season – allowed three Savannah runs (all earned) on four hits against four strikeouts. Espinoza has been the talk of the Red Sox minor league system for most of the summer, and with his debut became the youngest player to appear in a South Atlantic League game this season by more than a year. Espinoza's agent tweeted videos of him throughout the appearance. He was replaced in the top of the fourth by left-hander Jake Drehoff, who took the Drive the rest of the way, giving up a run on five hits against three strikeouts in 3 2/3 innings of work. Greenville's offense scored a run in bottom of the sixth to make it a 4-3 game but failed to complete the comeback. Designated hitter Rafael Devers paced the lineup at the plate, going 2 for 3 with an RBI double and two runs scored. The performance marked Devers' fifth multi-hit effort in his last six games. Center fielder Andrew Benintendi and first baseman Nick Longhi both went 1 for 3, with Longhi's contribution coming with two outs in the bottom of the sixth in the form of an RBI double. Benintendi also added an RBI. The Drive battled back to take game two of the doubleheader, scoring two runs in the bottom of the seventh and wrapping up the victory thanks to a walkoff Javier Guerra groundout. After Longhi reached on a fielding error to load the bases, Guerra stepped up and made contact, allowing third baseman Michael Chavis to score from third base to seal the win. Second baseman Yoan Moncada also deserves praise for scoring the game-tying run almost single handedly. Moncada reached on a single, stole his 48th base of the season and then reached third on a throwing error, crossing the plate thanks to a Devers sacrifice fly. Guerra posted the strongest game of the bunch, going 2 for 4 with two RBI. Benintendi added two more hits, going 2 for 3 with an RBI and a run scored. Right-hander Ben Taylor drew the start, giving up three Sand Gnat runs on four hits and three walks across 2 2/3 frames, also fanning four. Right-hander Mario Alcantara was strong through 3 1/3 relief innings, striking out four and limiting the damage to one run on three hits and a walk. Right-hander Ryan Harris earned the win after throwing a perfect seventh inning, which left the door open for the Drive offense to spark a rally. Harris faced three batters, striking out one to improve to 4-4 on the year. Greenville remains in a down-to-the-wire dogfight with Asheville in the South Atlantic League Wild Card standings, currently sitting half a game back of the Tourists with two games remaining in the regular season. Lowell opened its final series of 2015 with a runaway loss to Vermont, which came thanks to the Lake Monsters scoring 10 runs across the final three frames. 2015 sixth-round pick Travis Lakins drew the start, his first Spinners appearance since being promoted from the GCL Red Sox on Sept. 3, striking out three batters and walking one across two scoreless innings. Right-hander Daniel Gonzalez entered in the top of the third and threw the next four frames, dropping to 3-3 after allowing four runs on six hits against one strikeout. Right-hander Daniel Zandona, left-hander Javier Rodriguez and right-hander Enfember Martinez combined to throw the last three innings, with Rodriguez allowing three runs on three walks and failing to record an out. Martinez gave up three more runs across the eighth and ninth innings. Catcher Tyler Spoon and designated hitter Josh Ockimey each led the way for Lowell at the plate, both going 2 for 4 with two doubles. Ockimey one-upped Spoon in the RBI department, knocking in three runs to Spoon's one. Third baseman Victor Acosta and center fielder Tate Matheny also posted multi-hit games, each going 2 for 4 with a run scored. Acosta also added a double. Player of the Night: While Anderson Espinoza stole the spotlight in Greenville, Pawtucket right-hander Zeke Spruill quietly turned in an outstanding performance for his team, helping the PawSox cruise to a 6-2 victory by tossing seven scoreless innings. The 25-year-old – acquired from the Arizona Diamondbacks last December – turned in a seven-inning outing for just the second time this season, and his three hits allowed was far and away his lowest total for the season among outings longer than two innings.